An ongoing challenge is to manage the introduction and definition of new products. We must address customers' needs and take advantage of new technology, while providing continuity of product direction and a reasonable length of service so that existing technology is not prematurely abandoned. It is a process of trade-offs with numerous inputs to consider. Before evaluating the present and projecting into the future, let's consider the history of some Campbell Scientific datalogger models. We introduced our CR5 digital recorder in 1976. The first CR5s involved extensive use of Complementary Metal Oxide Semiconductor (CMOS) logic organized in the circuits of various modules. The modules measured different sensors with data outputs at fixed intervals as selected by electromechanical switches on the panels. CMOS was necessary for low power operation, with the benefit of portability in our dataloggers. When a CMOS microprocessor became available, a module was added to the CR5 (1978) to take advantage of the new technology. Some of the first tasks assigned to the microprocessor were computing wind vectors and capturing wind gust information. The CR21 Micrologger used a microprocessor as its foundation for programmability. It was programmed to accept inputs from different sensors, display measured values, and allow the user to set up input and output tables with a time interval corresponding to each table. Introduced in 1979 and manufactured until 1988, the CR21 established the basic datalogger functions built around a microprocessor. The CR7, 21X, and CR10 dataloggers, introduced in the 1980s, had operating system architectures built around a microprocessor more capable than the CR21's microprocessor. Users were able to take advantage of a structured programming language built into the operating system to perform fairly complex measurement and control tasks. In the 1990s our products incorporated new technology to expand memory and support greater processing speed. More recently, technology development has given us the ability to offer sophisticated digital signal processing in our CR9000 datalogger. As hardware technology has advanced, so has the software. The CR5 was set up by plugging modules together (each module specific to a type of sensor) and entering a time interval into an electromechanical switch. Today, setup information is entered into a program on a PC and then transmitted to the datalogger. This setup information includes sensor types, measurement intervals (which may vary from sensor to sensor), intermediate processing, output intervals and conditions, communication paths, and even PC settings. Many of our dataloggers that were manufactured over 10 years ago are in use today. During a time of rapid technology change, this is made possible through our efforts to maintain some reasonable backward compatibility as we move forward. Again, this is a matter of trade-offs. Newer models of dataloggers such as the CR9000, CR5000, and CR200 are programmed using CRBasic instead of Edlog. Still a structured language, CRBasic is easier to learn and remember for the occasional user because of its similarity to other BASIC computer languages. Future datalogger models will use the architecture of the CR9000, CR5000, and CR200 as a platform in a similar way that the CR7 architecture is now used in the CR10X, CR23X, and CR510. To extend the useful life of our products and allow datalogger networks to expand, we have invested in the development of network communications software and peripherals that support several different models. For example, a CR23X and CR5000 can be used in the same LoggerNet network with similar communication peripherals. A CR205 can be networked to a CR10X with an RF400 local radio link. The RF400 and CR205 are new products with the most recent RF communications technology, while the CR10X has been available since 1996. In planning our product strategy, we strive to balance the considerations of backward compatibility with potential improvements offered through advances in technology. 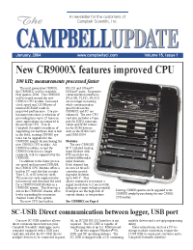 I hope that this balanced approach gives you a long product life with your investment in Campbell Scientific equipment while keeping you current with the advances of technology.